“My whole life has been a big improvisation — I follow my nose.” Improvisation has played a big role in Alan Alda’s career in more ways than one. From his early theatrical work to founding the Alda Center for Communicating Science to his latest book — If I Understood You, Would I Have This Look on My Face? The one, the only Alan Alda is On Brand this week (as Alan jokes, “I only brought one of me!”). Alan Alda has earned international recognition as an actor, writer, and director. He has won seven Emmy Awards, received three Tony nominations, is an inductee of the Television Hall of Fame, and was nominated for an Academy Award for his role in The Aviator. Alda played Hawkeye Pierce on the classic television series M*A*S*H, and his films include Crimes and Misdemeanors, Everyone Says I Love You, Manhattan Murder Mystery, Bridge of Spies, and many more. Alda is an active member of the science community, having hosted the award-winning series Scientific American Frontiers for eleven years and founded the Alan Alda Center for Communicating Science at Stony Brook University. Alda is the author of three bestselling books, If I Understood You, Would I Have this Look on My Face?, Never Have Your Dog Stuffed: And Other Things I’ve Learned and Things I Overheard While Talking To Myself. Avoiding lecture mode. 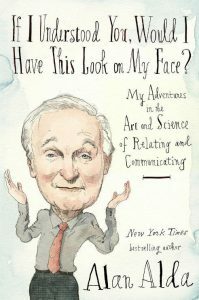 “I’ve interviewed hundreds of scientists.” However, Alda found that often, when explaining their work they go into “lecture mode.” That’s where you need to focus on relating instead of just communicating. Order matters. “Start with a story that matters to your audience.” This might not be the order that you would first think of to tell your story in. To learn more, go to alanalda.com and the Alan Alda Center for Communicating Science. This interview would not have been possible were it not for my fellow podcaster, Kerry O’Shea Gorgone of the Marketing Smarts podcast. When I heard that Kerry had spoken with Alan, I begged her to connect me so I could use the work in connection with my communication classes and curriculum at the University of Iowa! Thanks Kerry! This entry was posted in Podcast and tagged alan alda, communicating science, communication, improvisation. Bookmark the permalink.